With summer approaching and the weather hopefully finally warming up, I decided that a light gazpacho/soup would be a nice thing to make. I can't wait until I start going to Farmer's Markets for fresh sun ripened produce! Taber Corn is wildly available in my area and nothing beats the taste of grilled/roasted veggies in the summer, along side the fresh sweet taste of tomatoes! 1 cup fresh corn kernels (2 ears) or feel free to use BBQ or grilled corn! Roast/Grill Sweet Bell Peppers, tomatoes, onion, zucchini (instead of cucumber) ears of corn on grill or BBQ with rosemary/sea salt or any spice mix you would like (habanero, Cajun, cayenne, chili, oregano, Greek seasoning etc). Puree 1/2 the veggies in a blender until desired consistency is acquired. I prefer it thicker/chunkier. Add salt, chili flakes and crushed garlic. Remove corn when blackened. 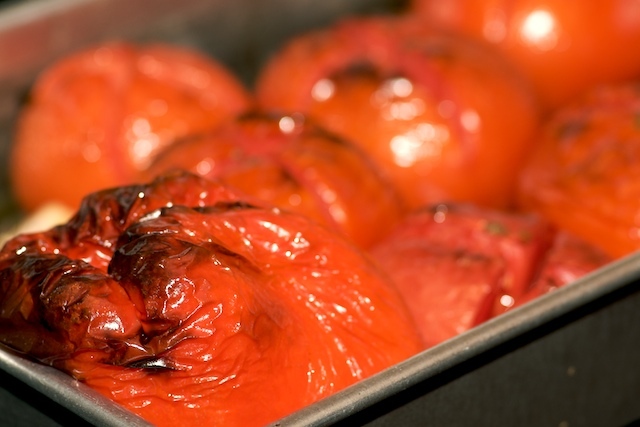 Allow remaining vegetables to cook until charred/roasted and allow to cool. Dice/ mince or process them until you reach desired thickness (smooth/chunky) and add to mixture. Add corn kernels to mixtures. Allow to simmer for 5 min. This is even better the next day hot or cold! Feel free to add black beans to up the fiber and turn it into more of a chili type stew/soup. I like adding habanero peppers, or any hot sauce (if fresh then roast it for additional flavor) . This is great on Tilapia, Chicken, beef, fish, potatoes, NACHOS (or tortillas) and as a sauce for enchiladas, burritos, quesadillas etc. If you want- use canned fire roasted tomatoes, peppers etc!